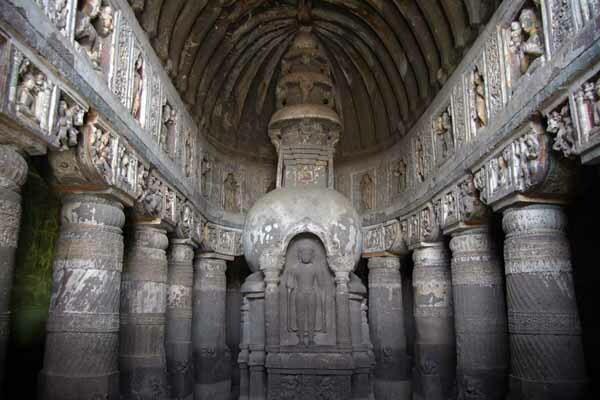 The Aurangabad caves located on a hill that runs roughly east to west and nearly 2 km north from Bibi ka Maqbara in Aurangabad, Maharashtra is a set of 12 rock-cut Buddhist shrines that are separated into three groups by a distance of 500 meters from each other. Caves 1 to 5 are situated on the western side while Caves 6 to 9 are situated on the eastern side of the same hill. The third group of caves which includes Caves 10 to 12 are situated further to the east. 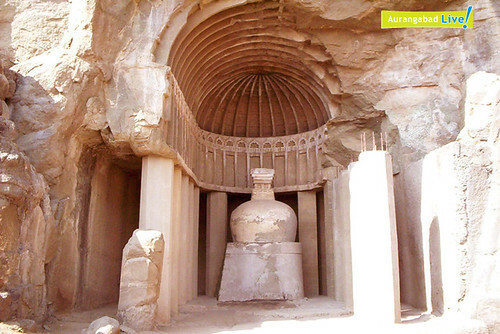 The Aurangabad caves date back between the 2nd and 3rd century AD to the 7th century AD. 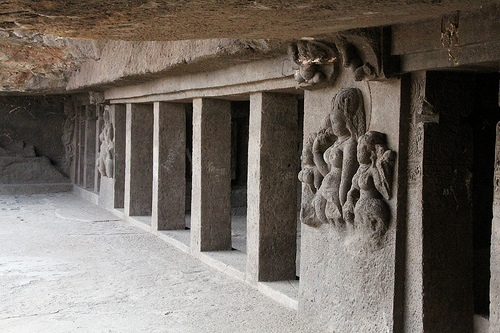 The caves carved into the hillside out of soft basalt rock are an admirable piece of architecture bearing finely sculpted forms of Indian classical art of the highest degree. 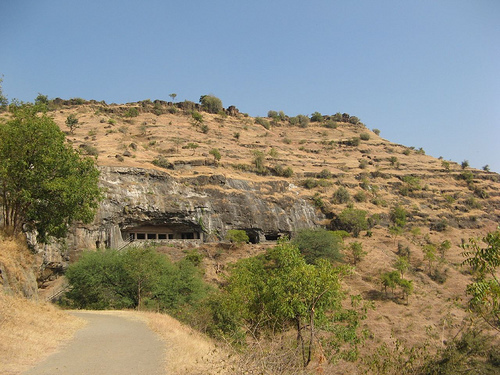 The Aurangabad Caves planted between the Sahyadri and Satara hills and watered by the Dudhana River is a common tourist spot. 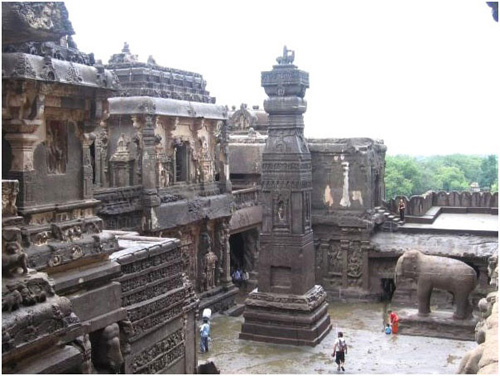 It is magnificent in its structural carvings and a living proof of the Buddhist settlement as far back as the 2nd and 3rd century. 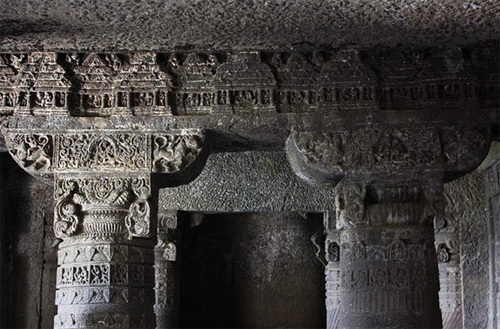 Housed inside the Caves are old fashioned pillars with intricately carved designs. They stand as testimony to the beautifully sculptured architectural work of that era. 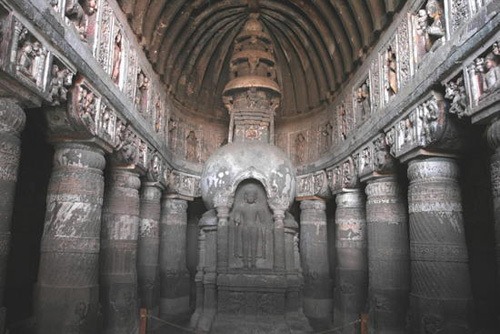 Cave 1 of the Aurangabad caves is one of the earliest excavations dating back to the 2nd or 3rd century. It is an unfinished Vihara or monastery where the ceiling of the verandah lies collapsed. The preservation of this cave is at a low due to the bad nature of the rock formation which has also prevented excavations on a large scale. Cave 2 is a square-shaped shrine that bears resemblance to traditional Buddhist temples. 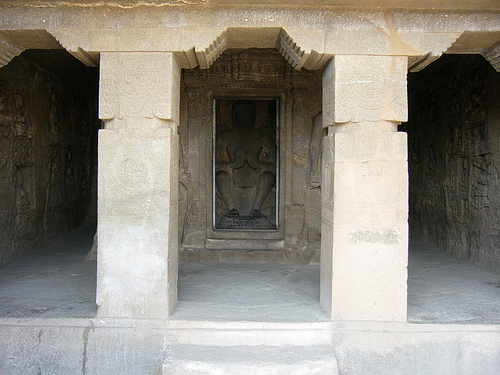 In the centre of it is a monumental image of a seated Buddha in a meditative pose encompassed by several other sculpted figures of Buddha that can be seen adorning the walls on either side. 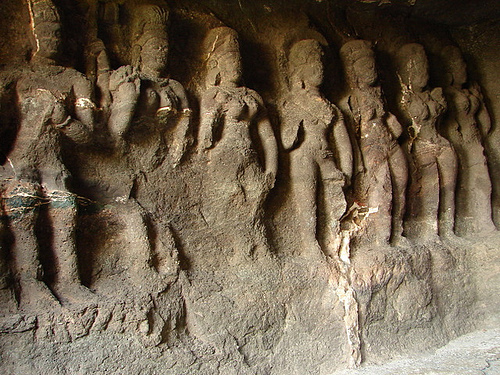 Another sculptural masterpiece of the Aurangabad caves are the beautiful celestial beings or Apsaras as they are known in Hindu and Buddhist mythology. They adorn the cave walls in a timeless splendor of artistry and shapeliness. Cave 6 is an exhibit of finely engraved women with exotic hairstyles and ornamental embellishments. Taking prominence in the centre of the carvings is a towering figure of Lord Buddha. This cave with cells on either side contains a shrine and is marked by pillars on the verandah and porch. Cave 7 is considered the most fascinating of all with its ornate representation of bejeweled and scantily clad female figures that were a marked sign of the presence of tantric Buddhism during this age. Cave 7 also consists of a shrine surrounded by an outer corridor right around. 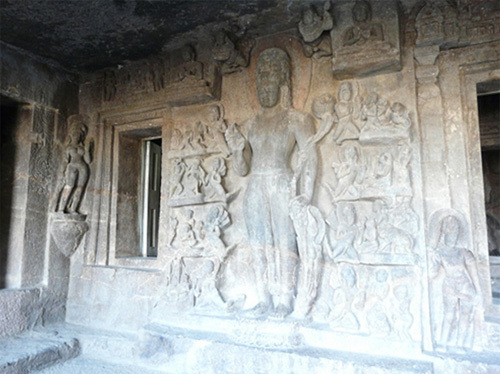 The corridor is made up of alcoves at regular intervals which display various sculptures of Buddhist gods and goddesses. In the verandah, the entrance to the shrine is flanked by elaborate depictions of Avalokiteshvara and Bodhisattva. 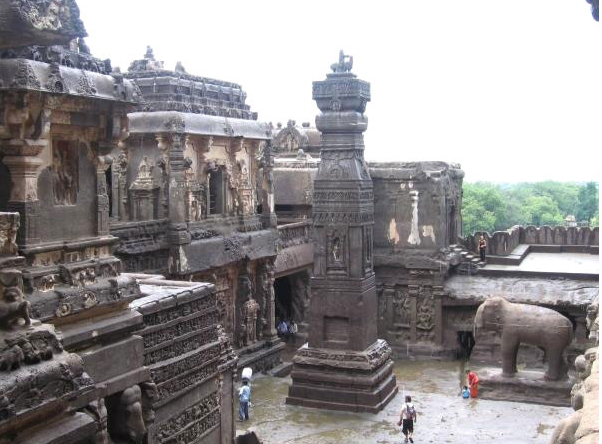 The Aurangabad Caves overshadowed by the Ajanta and Ellora Caves are still a delight to the eyes. It serves as a reminder to the pristine glory of the Buddhist religion during that period. Even though many of the caves remain unfinished due to the perils of the loose rock soil, for most part this monolithic sculpture has survived the sands of time. 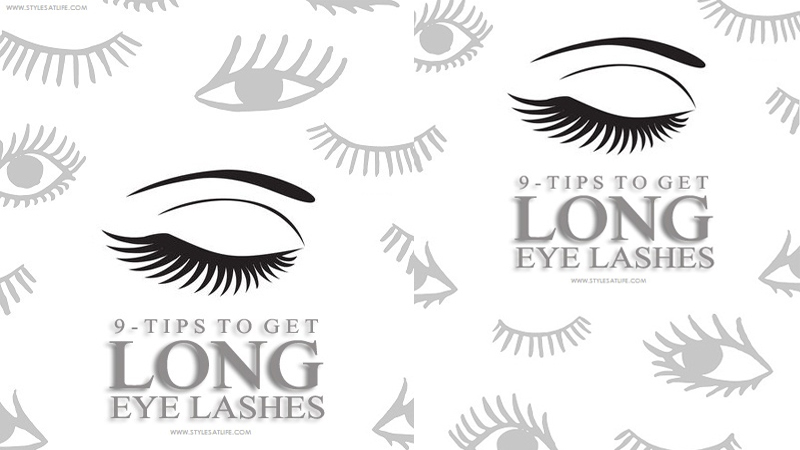 Images Source: 1, 2, 3, 5, 7, 9. 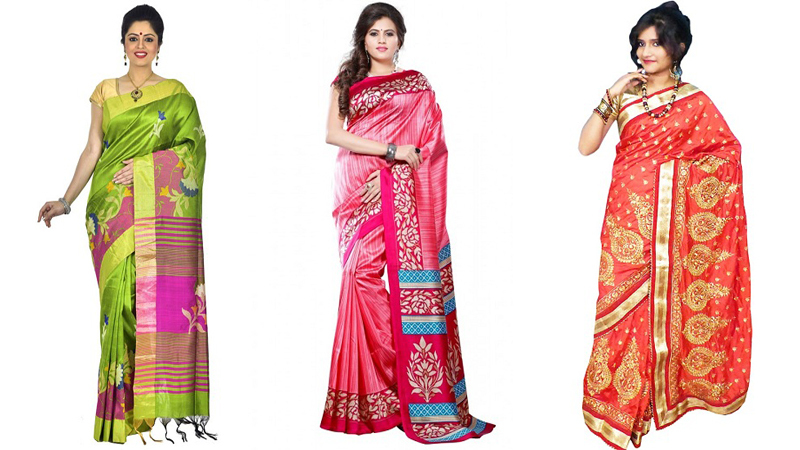 Lustrous Dupion Silk Sarees That Will Win Your Heart! How To Perform Varuna Mudra To Balance Water In Body?